This document is for developers that uses Java to make apps for Android. The docs target developers using Android Studio, Eclipse, or IntelliJ. Java apps/games use the ouya-sdk.jar library included in the ODK downloadable from the Cortex developer portal. 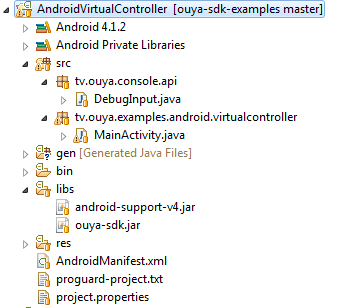 Using Java, prepare a Bundle with additional key/value pairs which are used to initialize the OuyaFacade. // We must tell the OuyaFacade that we can use the Xiaomi market for purchases. // Pass the Activity for the context parameter when initializing the OuyaFacade. // Passing the application context for the context paramter will not work on Xiaomi. The screensaver should be disabled while your game is running. Invoke View.setKeepScreenOn(true) to disable the screensaver. Here is a common scenario of an activity loading the layout and using the content View to disable the screensaver. The ouya_xiaomi_icon.png 284x160 icon should be places in res/drawable-xhdpi/ouya_xiaomi_icon.png. Java uses standard Android localization for localized string resources. Strings can be placed in designated folders which are automatically selected using the current language. The virtual controller example exercises the new OUYA-Everywhere input. The button names and images are now accessible from the API. And the virtual controller buttons highlight with multiple controllers for supported controllers. TextViews display the incoming keycode values and the remapped keycodes after the OuyaInputMapper has remapped the input. 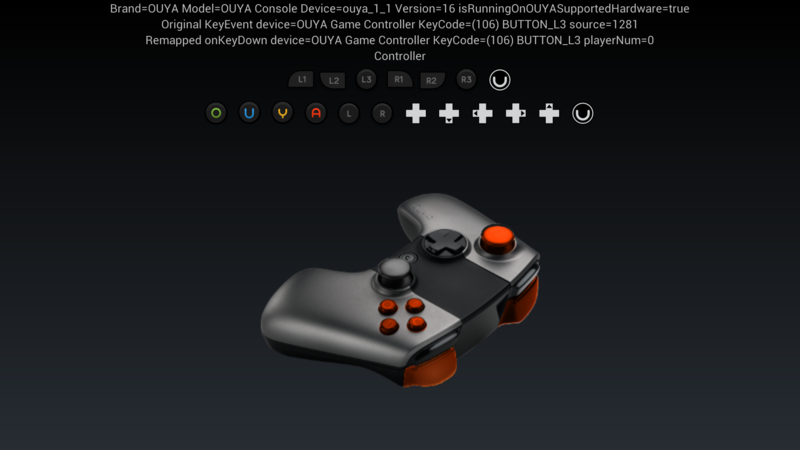 The AndroidVirtualController source code can be found within the ouya-sdk-examples. The AndroidVirtualController example uses the OuyaController.getButtonData API to display device specific controller images. The project has a small number of key files that makes the example work. Specifies the target Android API level of 16 and the starting activity. The starting and only activity in the project responsible for the logic to display text, buttons, and toggle image visibility based on input. A debug class for displaying keycode and axis value input in human-readable format in the logcat. The Java library released through the ODK in the developer portal which provides access to the OUYA SDK. The Android layout that specifies the position and content that displays text and images. The drawable resources hold the icons and controller images used in the example. The MainActivity extends the OuyaActivity from the ouya-sdk.jar for the easiest way to add OUYA-Everywhere input. Accepts the ImageView that will display the button image and the keyCode id for the corresponding button image. The ButtonData image can also be converted to a Bitmap which can be used in other cases. Loads the layout and gets the references to the ImageView controls that will handle toggling button visibility when toggled. Input can be event based, or spawn a thread to set visibility on an interval. The menu button is pressed and the visibility needs to be cleared after an interval rather than waiting for an event to clear it. Initialization displays build information and sets the drawable button images from the new api. The axis events arrive with onGenericMotionEvent after the OUYA-Everywhere has remapped the input. When a button is pressed the corresponding image is highlighted. When the system button is detected, the image is highlighted for an interval. When the button is no longer pressed the ImageView for the highlighted button is hidden. 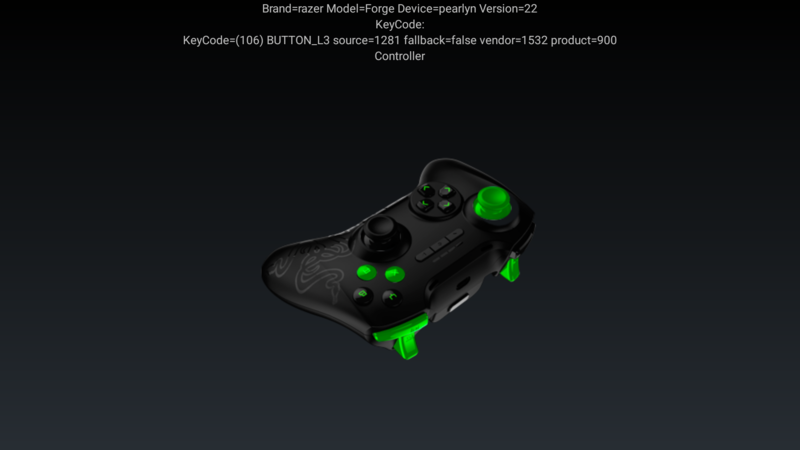 The RazerVirtualController example includes virtual controller images and mappings for the Razer Serval Controller. 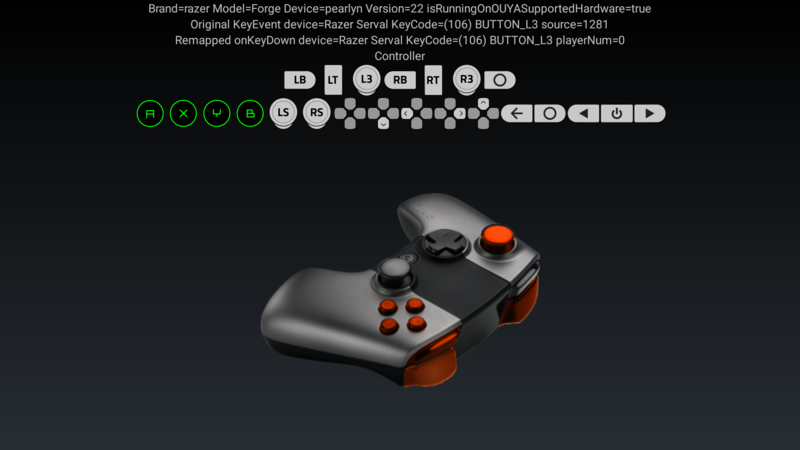 The RazerVirtualController source code can be found within the ouya-sdk-examples. The ODK download in the developer portal includes an in-app-purchase sample application. The OuyaFacade has several listeners for in-app-purchase callbacks. // Your game talks to the OuyaFacade, which hides all the mechanics of doing an in-app purchase. Implement the listeners to pass to the OuyaFacade IAP methods. Be sure to check out the in-app-purchasing document for additional IAP details.